Bing seems to be on a small war path with Google. Earlier this week we already highlighted some of its social search strategy, but Bing has a broader challenge: Google. Microsoft has been actively promoting their search engine in different ways, along the way ‘attacking’ Google directly. And that while Bing is already gaining a little ground on Google in market share in the US last August. While Comscore numbers show a small increase of Bing shares in the US and a small decline for Google, Bing is actively working on their visibility by doing a ‘Bingiton’, a TV campaign, by changing the name of Microsoft Advertising and by trying to lure away Google Adwords customers. All actions are not just aimed at showing how good Bing is though, they are also very much ‘against’ Google. A week ago Microsoft started the “Bing It On Challenge”. They first claimed that a research from an independent research company showed people preferred the Bing search results over those from Google. Based on that created a tool BingitOn (http://www.bingiton.com/) where (US only) users could try out the differences between the two themselves. Basically you could do a search, determine which result page you found better and share your findings on Social Media. The challenge was combined with a TV Ad which directly challenged Google, as if it was a Pepsi vs Coca Cola test. Meanwhile on another front Bing is pushing their name as well. Microsoft Advertising (yes the former employer of Mel Carson) only a few days ago announced it was changing their name into adCenter Bing Ads. In this network Bing decided to go even a little bit more aggressive towards Google. They are now actively trying to convince users to make the switch from Google Adwords to Bing Ads. And they are trying to make it as easy as possible for these users by introducing Import Campaigns. 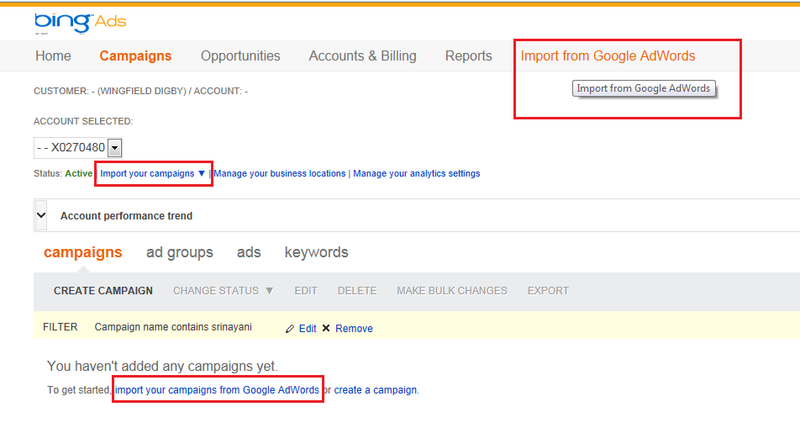 Import Campaigns does what the name suggests: in just a few steps you can import your Google Adwords into your Bing Ads. It couldn’t be easier. So while Bing is taking on an aggressive attitude towards Google, they were already winning a bit of ground on Google. Comscore numbers for August show that in the US Google lost some share (0.4%) and both Bing and Yahoo won (0.2%). This is as high as Bing has ever been in market share. So where will this end? Bing’s actions remind me a lot of politicians trying to make the other one look bad. Usually that is not a good sign, because it doesn’t really show how good you are yourself. But it is the ‘American way’ of working. I do believe that a stronger Bing is good for both the industry and the development of search. So that definitely is a good thing. The ‘tone of voice’ used might not be something I like, maybe the fact that they are finally doing something is a good thing? Hey Bas, I tried to pull some data from Twitter regarding which search engine people ended up preferring in the Bing It On challenge. I ended up with a sample size of n=238 with people preferring Google almost 3:1. I just wrote about it on my blog. I would link you, but I don’t want to spam. Lol. Let me know if you or anyone in the comments would be interested in seeing it and I will post the link. Would like to see the url Paul ;). Any chance the difference has something to do with the type of audience on Twitter compared to ‘general’ public? only tested people from San Diego, ages 18 and older. I actually really like the tone of the Bing It On campaign — it’s playful and has some swagger without being abrasive. I’m a millennial, so I’m almost certainly the target audience.